The Dreamliner saga: What is the value of an inaugural flight? Launch customer All Nippon Airways Co. provides an example of the lengths to which airlines and Boeing have gone to keep 787 flights operating. ANA’s inaugural flight from Seattle to Tokyo of one of its Dreamliners last October was delayed by 24 hours because of a faulty electronics cooling pump that has been a persistent problem for operators of the new jet. With the twin-engine 787 stranded at the gate, ANA and Boeing officials trekked to the company’s nearby facilities to find a spare, according to a person familiar with the move. Boeing has since redesigned the pump. Boeing spokesman Marc Birtel said the company continuously works with all its customers to keep aircraft in revenue service and said the plane maker worked with ANA to solve the issue with parts from its spares facilities. United Continental Holdings Inc. has also resorted to creative measures. Worried about the 787’s reliability—which already prompted a delay in the start of service with the jet between Houston and Lagos, Nigeria—United had at least two of its six 787s on standby for the airline’s first trans-Pacific flight from Los Angeles to Tokyo, according to a person familiar with the planning. The scheduled 787 left as planned, and two of the reserve planes flew back to Houston without passengers, according to the same person and flight-tracking website Flightaware.com. United spokeswoman Megan McCarthy said repositioning empty aircraft isn’t uncommon, but wasn’t able to say specifically if the extra 787s in Los Angeles were in place to support the Tokyo flight. Although the evidence is anecdotal, it shows how much airlines value an inaugural flight, in this case, United, Los Angeles to Tokyo. Suppose that with 95% probability an aircraft will have no issues, and there is a 5% chance that a flight-delaying problem will be discovered. Let’s not worry about revenues yet, just try to quantify losses from a potential delay for an inaugural flight and compare it with an ordinary flight. Will globalization help Ford manage inventory? 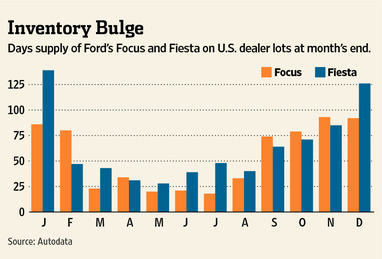 So here we go again – car inventory at Ford is growing, specifically, new Focuses and Fiestas. WSJ reported on this recently and so did my colleagues at Kellogg. The graph of inventory is indeed telling, so I’ll repost it here. We know what such inventory stockpiles usually leads to – lower prices. This time, though, it can be different.